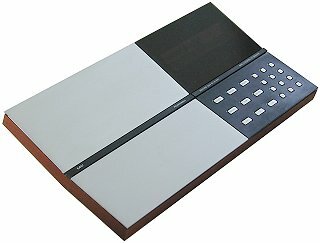 This final development of the Beocord 8000 range offered Dolby C NR in addition to the B type fitted to previous models. Dolby C did not prove very popular, certainly pre-recorded tapes were never encoded this way, and few other recorders offered it. This limited the usefulness of the system then to making good recordings to be played back on the Beocord 8004 itself only, even the lesser models in B&O’s own range did not have Dolby C decoders. Text copyright © Beocentral. Unauthorised reproduction prohibited. The end of Beocord 8004 production marked the end of the series, though by this time the Beocord 5000 had appeared, but even though this offered Dolby B and C, and the HX Pro system, this is the last that would be seen of the real time tape counter, direct access to any time on the cassette and the built in programming facility. Text copyright © Beocentral. Unauthorised reproduction prohibited.